There’s just something about facing the Boston Red Sox that makes you feel better about things. Despite hitting just .231 with runners in scoring position, the Tampa Bay Rays walked away from Fenway Park with a series win under their collective belts. The Rays are now 4-2 against the Red Sox and 15-13 overall (14-14 Pythagorean Expectation). The team will return to the Big Top on Thursday where they’ll start a four-game set against the Texas Rangers. Much like the Rays, the Rangers have a significant number of players on the DL (10). However, unlike Tampa Bay, Texas hasn’t been nearly as consistent — the Rangers have struggled to an 11-6 record (12-15 Pythagorean Expectation). Even so, Texas has taken four of its last five, with two of those wins coming in high scoring games. Tampa Bay has posted a 9-6 record against Texas, extending back to 2013, while the Rangers lead overall 83-71. Chris Archer vs. Nick Martinez: Archer allowed a season-high four runs to Baltimore on Saturday, snapping 28-2/3-inning streak without an earned run. The righty ranks in AL top five in ERA (1.64), strikeouts (42), opponent average (.176), and is 1-0 with a 2.23 ERA in three starts against Texas. The Rangers have won all five Martinez’s starts, however, he has three consecutive no-decisions. He ranks just behind Archer in ERA. 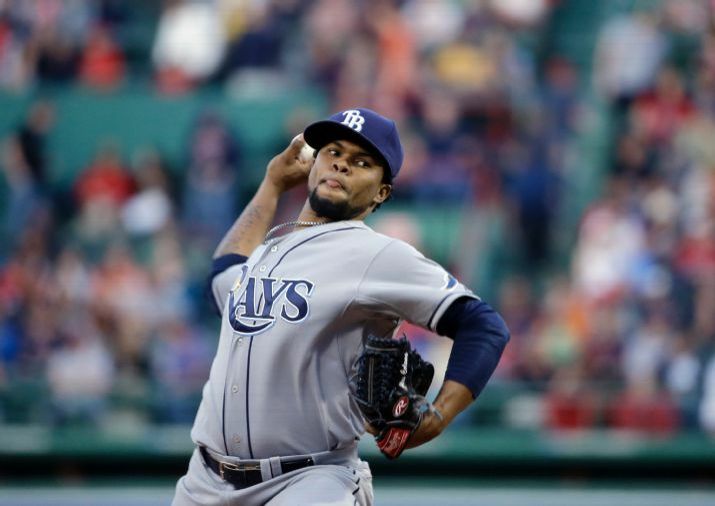 Martinez made his big-league debut at Tropicana Field on April 15, 2014, taking no-decision in 5-4 loss. Nathan Karns vs. Yovani Gallardo: Karns got a no-decision against Baltimore on Sunday, allowing no runs on two hits in five innings. He is 0-1 with a 5.40 ERA in four career starts at Tropicana Field, and will be making his first career appearance against the Rangers. Gallardo was charged with three earned runs on seven hits over 6-2/3 innings in a 7-1 loss to Oakland on Sunday. Martinez threw 118 pitches in that outing, the most of any starter on the Rangers’ rotation. Jake Odorizzi vs. Ross Detwiler: Odorizzi allowed just one run on seven hits while striking out six in a seven inning start against the Red Sox on Monday. The righty successfully pitched out of jams throughout his outing, posting just two clean innings en route to his third win of the season. Detwiler allowed one run in seven innings in his last start against the Astros. However, it was the first time in five starts the Rangers won with him on the mound. He has a 2.19 ERA in his last two starts after posting a 10.95 ERA in his first three. Drew Smyly vs. Wandy Rodriguez: Smyly held Boston hitless through five innings Tuesday, then Mookie Betts homered to lead off the sixth. That was enough to hand Smyly a hard-luck loss. Smyly is 2-1 with a 2.25 ERA in nine career appearances against Texas. Rodriguez earned his first victory in almost two years by beating the Astros on Tuesday, allowing just one run in eight innings in the longest outing by a Rangers starter this season. Rays and Rangers series starters. 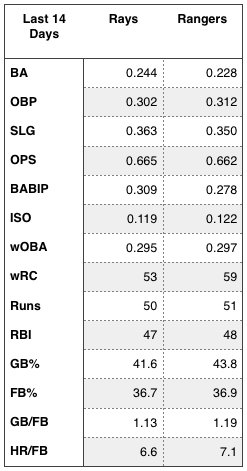 Rays and Rangers offensive production over the last 14 days. 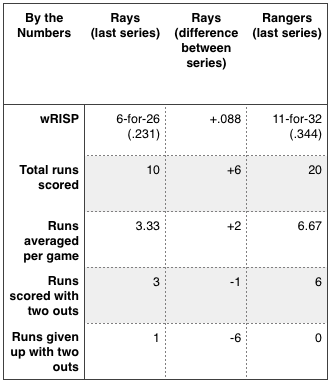 Rays and Rangers by the numbers. Nick Martinez: Per Rotowire, Martinez shut out the Angels over six innings Sunday, scattering seven hits and walking two. He did not factor into the decision. In his only start against the Rays last season, Martinez posted six innings of three-run ball. His repertoire features a low-90s fastball, slider and changeup, and he tends to get a lot of ground balls (a 48.8% GB% over the last 14 days speaks to that). Key match-ups: Asdrubal Cabrera (2-2, 2B), James Loney (1-1, 2B, 2 BB). Yovani Gallardo: Per Rotowire, Gallardo tossed his second consecutive quality start Sunday against the A’s, giving up three runs on seven hits and four walks over 6.2 innings. The 29 year-old RHP has just seven innings of accrued work (against the Rays) under his belt. In that start, Gallardo held the Rays to just five base runners (four hits, one walk) while fanning five. Gallardo is a curveball/slider/fastball heavy pitcher who wants you to pound the ball into the grass. Key match-ups: David DeJesus (4-14, 2 2B, HR, 2 RBI, BB), James Loney (5-17, 2B, 3 RBI, BB). Ross Detwiler: Per Rotowire, Detwiler (0-3) had no decision Tuesday against the Astros but only gave up one earned run in seven innings, striking out seven batters. Detwiler is another pitcher who the Rays haven’t seen much of, in fact they’ve amassed all of 3-2/3 innings against the former National. Key match-ups: Evan Longoria (1-3). His fourseam fastball is basically never swung at and missed compared to other pitchers’ fourseamers, has good “rising” action, results in somewhat more flyballs compared to other pitchers’ fourseamers and has slightly below average velo. His curve is a real worm killer that generates an extreme number of groundballs compared to other pitchers’ curves, has a sharp downward bite and has slight glove-side movement. His sinker has little sinking action compared to a true sinker and has slight armside run. His change is an extreme flyball pitch compared to other pitchers’ changeups, generates more whiffs/swing compared to other pitchers’ changeups, has a lot of backspin and has slight armside fade. Key match-ups: Logan Forsythe (2-4, RBI), Evan Longoria (3-8, 2B, HR, 4 RBI, BB). — Food for thought: The Rays scored just five runs Wednesday after having had 19 reach base on nine hits, nine walks and a hit batter. — Second baseman Nick Franklin went 1-3 at the plate in his first rehab game for Triple-A Durham on Tuesday. Franklin hit a single and struck out once in the appearance. In his second rehab game, Franklin went 0-2 with two walks. He was briefly checked by the team trainer after a swing but stayed in the game. Franklin is slated to see 20-30 at-bats before rejoining the Rays, likely in place of Jake Elmore. — Jake McGee is likely to make three more appearances for the Durham Bulls; at least one where he works part of two innings. On that schedule, he wouldn’t rejoin the Rays until the May 15-20 trip to Minnesota and Atlanta. Lineup Change: LHP Everett Teaford now on the hill for Durham, replacing RHP Matt Andriese. As it turns, Andriese is fine. He was scratched from Friday’s start in case he was needed by Tampa Bay. Per Marc Topkin, there isn’t an apparent reason although a few of the guys on the big league squad have exhibited flu-like symptoms.